Last week, we reported that Sigma had released firmware updates for several of its Global Vision-series lenses. The updates was designed to allow compatibility with Canon’s in-camera Lens Aberration Correction. However, it seems the updates may have had unintended consequences. A site visitor noticed that after updating his Sigma 50mm f/1.4 Art lens' firmware to v.2.00, his lens exhibited noticeable backfocusing which required a -8 setting at various focus settings to correct via the Sigma USA Dock. As I had yet to update my own Sigma 50mm Art's firmware, I decided to see if I replicate the issue. I tested the lens' performance on my 5D Mark III and 7D Mark II and the lens focused accurately with no AFMA value applied in-camera or in-lens (via the USB dock) with firmware v.1.00. After updating Sigma Optimization Pro to the latest version, I upgraded the Sigma 50A's firmware to v.2.00. After the upgrade, the lens required a -6 AFMA correction to be applied either in-camera or in-lens (at all focus distances) for accurate autofocusing. Note that the Sigma 50mm Art lens' AF was advertised as being adjusted in its specific firmware release notes for "an improved focus accuracy during Live View mode." We're interested to know whether or not the AF recalibration is necessary for all of the lenses whose firmwares were updated, or if it's only the Sigma 50mm Art that's experiencing the issue. So if you have one of the following lenses and you'd like to provide your feedback, apply the latest firmware update and let us know if your lens required recalibration for accurate AF. For customers who own the SIGMA MOUNT CONVERTER MC-11 SA-E / EF-E, please update the firmware via SIGMA Optimization Pro? by connecting it to a computer using the supplied USB Cable. After completing the firmware update, please remove the battery from the camera, re-insert it and turn on the camera before attaching the MC-11. * Please note that this does not guarantee accurate operation with all the lenses that are not compatible with the MC-11. The Sigma Corporation is pleased to announce a firmware update for the SIGMA 30mm f/1.4 DC DN | Contemporary in Sony E-mount is now available. Improved AF performance when the “Eye AF” function is selected. Improved AF performance in the peripheral areas in the image, when the “Lock on AF” function is selected. Improved feeling of the MF operation of the lens. To update the firmware, please refer to this link. B&H carries the Sigma 30mm f/1.4 DC DN | Contemporary Lens. It looks like Sigma has been diligently working to fix bugs and ensure their Global Vision lenses work properly with recently announced gear. It has corrected the phenomenon which may occur with the combination of SIGMA MOUNT CONVERTER MC-11 and some of SIGMA’s interchangeable zoom lenses on Sony a9 (ILCE-9) that when using AF-S mode and shooting in telephoto range, it could occasionally display the shot as in focus, although it may not be correctly locked on the subject. It has become compatible with the SIGMA 24-70mm F2.8 DG OS HSM | Art for SIGMA (Firmware Ver.1.02), CANON (Firmware Ver.1.02), as well as the SIGMA 100-400mm F5-6.3 DG OS HSM | Contemporary for SIGMA (Firmware Ver.1.02) and CANON (Firmware Ver1.03). The above firmware updates are available for installation in Sigma Optimization Pro via the Sigma USB Dock. 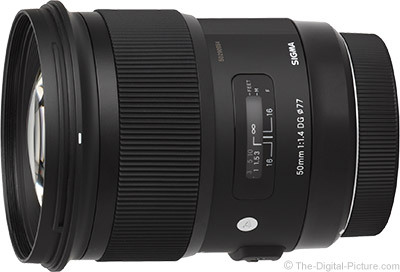 In addition to firmware updates detailed above, Sigma announced today that they are now offering a rear filter holder installation service for the otherwise incompatibile-with-front-filters 14mm f/1.8 DG HSM Art lens. The Rear Filter Holder FHR-11 is an accessory exclusively designed for the SIGMA 14mm F1.8 DG HSM | Art for Canon, and it enables photographers to use a filter sheet with the lens.By attaching it to the rear of the lens, it will allow more freedom of expression. For details of cost and the commencement of the service, please contact your nearest authorized SIGMA subsidiary / distributor. In case it is not convenient for your environment to use the installation service and you prefer to do it by your own effort, the necessary parts can be sold.Please contact your nearest authorized SIGMA subsidiary / distributor for further information. Customers who do not own the appropriate tools or who do not feel confident in attaching the filter holder themselves may take advantage of the chargeable installation service. We would like to announce that a firmware update for the SIGMA 24-70mm F2.8 DG OS HSM | Art for SIGMA and CANON, as well as a firmware update for the SIGMA MOUNT CONVERTER MC-11 SA-E and EF-E is now available. This firmware update corrects the phenomenon that the OS mechanism does not operate properly when attached to the SIGMA MOUNT CONVERTER MC-11 SA-E / EF-E. It has corrected the phenomenon that the OS mechanism does not operate properly when attached to the SIGMA MOUNT CONVERTER MC-11 SA-E / EF-E. It has become compatible with the SIGMA 24-70mm F2.8 DG OS HSM | Art for SIGMA / CANON (ver. 1.01). For customers who own the SIGMA USB DOCK, please update the firmware via SIGMA Optimization Pro. For those who own the SIGMA MOUNT CONVERTER MC-11 EF-E, please update the firmware via SIGMA Optimization Pro* by connecting it to a computer using a supplied USB Cable. It has corrected the phenomenon that the OS mechanism does not operate properly when attached to the SIGMA MOUNT CONVERTER MC-11 EF-E. It has become compatible with the SIGMA 100-400mm F5-6.3 DG OS HSM | Contemporary for CANON (ver. 1.02). Thank you for purchasing and using our products. We would like to announce a firmware update for the SIGMA MOUNT CONVERTER MC-11 SA-E / EF-E.
For customers who own the SIGMA MOUNT CONVERTER MC-11 SA-E / EF-E, please update the firmware via SIGMA Optimization Pro by connecting it to a computer using the supplied USB Cable. We will continue to consider ensuring stable operation of lenses that are not compatible with the MC-11. Therefore customers who are using the MC-11 can enjoy photography as much as possible with their own lenses even though there may be some restrictions. However, please note that due to the characteristics of the products, accurate operation, including AF, is not guaranteed with lenses that are not compatible with the MC-11. Thank you for purchasing and using our products. We would like to announce a firmware update for the SIGMA MOUNT CONVERTER MC-11 EF-E. This firmware update allows compatibility with the SIGMA 14mm F1.8 DG HSM | Art, SIGMA 24-70mm F2.8 DG OS HSM | Art, Cine Lens 14mm T2 FF EF mount and 135mm T2 FF EF mount from FF High Speed Prime Line. It has become compatible with the SIGMA 14mm F1.8 DG HSM | Art and SIGMA 24-70mm F2.8 DG OS HSM | Art. It has become compatible with the FF High Speed Prime Line SIGMA 14mm T2 FF (EF) and the SIGMA 135mm T2 FF (EF). B&H carries the Sigma MC-11 EF-E Mount Converter. It has improved the AF performance. Sigma Corporation would like to announce a firmware update for the SIGMA 100-400mm F5-6.3 DG OS HSM | Contemporary for Canon and SIGMA MOUNT CONVERTER MC-11 EF-E is now available. We would like to announce the availability of a new firmware update for the following Canon mount lenses. The lens firmware updates improve the AF accuracy when it is mounted on the SIGMA MOUNT CONVERTER MC-11 EF-E, and offers the improved usability for video shooting.For customers who own the following applicable products and the SIGMA USB DOCK, please update the lens firmware using SIGMA Optimization Pro. * It is necessary to use the SIGMA USB DOCK for Canon ver.1.02 or later to update the firmware. *For customers who own SIGMA MOUNT CONVERTER MC-11 EF-E, it is necessary to update this to the latest firmware ver. 1.05. * For this update, it requires the firmware of the SIGMA USB DOCK for NIKON to be Ver.1.01 or later. * Before updating the firmware of the 500mm F4 DG OS HSM | Sports for NIKON, Please ensure SIGMA Optimization Pro has been updated to Ver1.4.1 or later for Windows, or Ver1.4.0 or later for Macintosh. Compatible with SIGMA 100-400mm F5-6.3 DG OS HSM C017. B&H carries the Sigma 500mm f/4 DG OS HSM Sports Lens and USB Dock and has the Sigma 100-400mm f/5-6.3 DG OS HSM Contemporary Lens available for preorder.